Heat oven to 450°F. Remove pie crusts from pouches. On lightly floured surface, unroll and stack crusts one on top of the other. Roll to 17x12-inch rectangle. 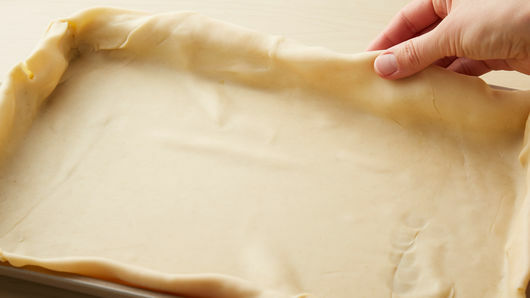 Fit crust into ungreased 15x10x1-inch pan, pressing firmly into corners and sides. Fold crust even with edges of pan. 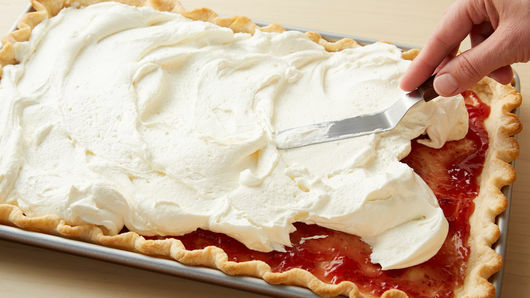 Flute or crimp edges; prick crust several times with fork. Bake 10 to 12 minutes or until golden brown. 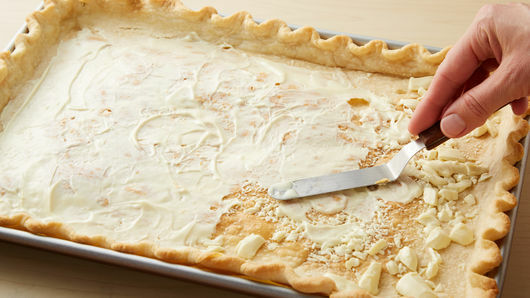 Coarsely chop 4 oz of the white chocolate; sprinkle onto hot pie crust, and let stand 5 minutes. With offset metal spatula, carefully spread melted white chocolate across bottom of crust (will be thin layer). Freeze 10 to 15 minutes, or until set. Meanwhile, in small microwavable bowl, microwave 7 oz of the remaining white chocolate and the milk uncovered on High 30 seconds; stir. 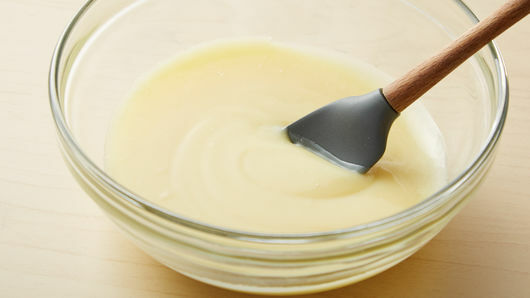 Continue heating in 10-second increments, stirring after each, until white chocolate can be stirred smooth. Set aside to cool. Shave remaining 1 oz white chocolate, and set aside for topping. In large bowl, beat cream cheese and powdered sugar with mixer until well blended. Add cooled white chocolate mixture to bowl; beat until well blended. Gently fold in whipped topping. Spread jam on top of set layer on crust. Spoon white chocolate mixture onto jam layer; carefully spread to cover jam layer. Refrigerate at least 1 hour until chilled. Just before serving, top with strawberries and reserved shaved white chocolate. White chocolate comes in different brands and different thicknesses. We used a thicker bar for this recipe, and found that coarsely chopping it helps it melt on the hot pie crust, making it easier to spread. Make chocolate shavings by carefully using a sharp vegetable peeler. 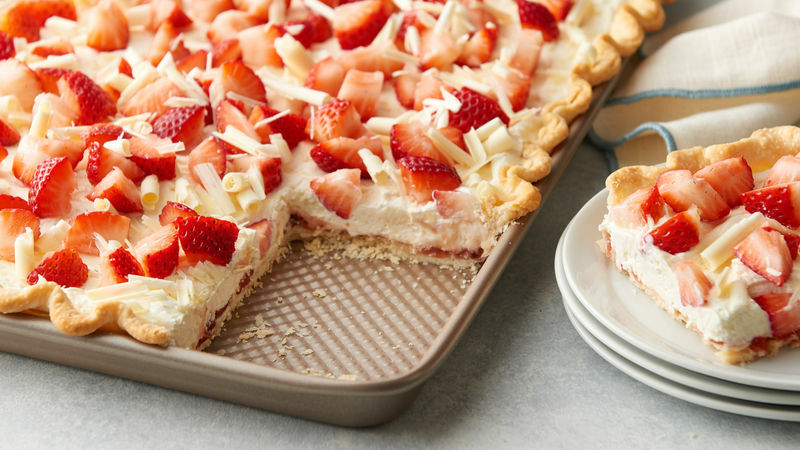 Wait to top your pie with fresh strawberries until right before serving to avoid any watering out onto pie top.